Can I Feed My Dog A Vegetarian or Vegan Diet? Yes, you can feed your dog a vegetarian diet, but you could also push your car instead of drive it, but why would you want to? The reality is dogs thrive on meat, which is a character trait unique to carnivores, but new research is suggesting they may be omnivores -- a small percentage of the time. What this simply means is much of the nutrition their body's need in order to function optimally and thrive is most efficiently obtained through eating meat - the tissue of other animals, but that they can also digest, within reason, plant matter. The best way to truly answer the question of whether or not a dog should be fed a vegetarian or vegan diet is to look at what science tells us about the process by which dogs obtain, process, and manufacture nutrition most efficiently. As part of saliva production for an omnivore and carnivore, the starch and carbohydrates enzyme, amylase is included. You won't find this plant matter dismantling enzyme within the saliva of a dog -- and even a cat, for that matter. If a dog does happen to eat a starchy food, amylase is still required to digest it, and the duty falls on the pancreas to produce amylase. This isn't a problem for small amounts of starches and carbohydrates -- the pancreas can handle it -- but a demand to digest a large amount of starches or carbohydrates is not what a dog's pancreas evolved to do. It's also hugely important to compare and make reasonable sense of the interior anatomy of a dog versus other known omnivores and herbivores. The intestines of a carnivore, in this case a dog, is very short in relation to the intestines of an omnivore, a human being, and is especially short compared to the intestines of an herbivore, such as a cow or a horse. Longer intestines are found in herbivores because extracting nutrients from plant matter takes longer to do. The short digestive tract of a carnivore would never have enough time to extract the amount of nutrients it needs to thrive, let alone the digesting plant matter even containing the required nutrients a dog needs. If you stare at your dog long enough, you'll notice certain physical characteristics about him or her that suggests their very existence today, while partly dependent on human intervention more recently, rests solely on the way natural selection allowed them to survive - consuming other animals. Look in your dog's mouth - regardless of how big or small the breed is, they have long canines and lack molars for chewing - not tools an omnivore would favor or thrive with, let alone an herbivore. Their feet are in a constant running position which allows them to not waste any time in hunting another animal. Did you ever feel their chest? It's very padded, and for good reason! Plant's don't kick or try to defend themselves while being attacked -- animals that run, do! Not to mention, did anyone ever ask a dog what they'd prefer to eat? Sure, they can't communicate in human language to do so, but is it not obvious dogs normally don't come running into the kitchen when the kale is in the steamer - they want meat! Ok, maybe some dogs enjoy kale, but when we look at the receptors found in a dog's nose, they're geared more towards meat consumption rather than plant. The nose receptors of herbivores and omnivores are hard wired to gravitate toward sodium chloride (i.e., salt, or sodium). Salt is sufficiently found in the meat of animals, but in plants, not so much. This would explain why dogs don't have these "salt receptors", because meat, a predominant part of their diet, already contains it -- there's no need to look for what doesn't need to be found. "A problem arises when a dog's health deteriorates, and their diet is not only not considered, but not altered if the dog's health call's for it - that's irresponsible." In the entire history of existence, somewhere, a dog has eaten a plant. They continue do so intentionally and unintentionally, but they also consume homework, and other valuable items. So to understand which of these items a dog can digest well and thrive upon best is to look at its genetics. New research reveals, that unlike wolves, dogs have the bonus of 3 genes that allow for the digestion of starch and glucose. As far as empirical evidence goes, wolves have been observed, after a kill, to consume the contents contained within the stomach of their prey. Most of the time, their prey is usually an herbivore, and the contents within the stomach are plant matter. However, it should be noted, that not just the contents of the stomach are consumed, but also nearly every other part of their prey's body. While it's a good idea to look at the closest relative of the dog for nutritional guidance and suggestions, dogs are their own species and should be seen as a dog, not a wolf. That's great, but your dog isn't and shouldn't be considered one just because you want them to be. Choosing to remove meat from your dog's diet does not change the required nutritional source needed to maintain their homeostasis. Sure, one could feed a dog a completely vegan diet -- they can intentionally and artificially convert the dog's diet, not their dietary needs - two different things --, to an herbivorous one. The best effort could even be made to assure proper supplementation is present while a dog consumes a vegetarian or vegan diet, but as it was mentioned from the start, you could push your car to where you need to go, but why not just drive it? Science can tell us how things works, but science can't account for all factors applied in the real world. Science is great, because it can give direction to the most reasonable and logical explanation, but to draw a conclusion and never change it when new evidence is presented is irresponsible, close-minded, and just non-science! Not all dogs are the same, just like not all humans are the same - genetically speaking. While everything about a dog reasonably suggests that meat should play a predominant role in a dog's diet, with a smaller occupancy of plant matter, to completely omit meat from a dog's diet should be solely based on that specifics dog's response to such a diet. The diet should conform to the dog, and not the dog conforming to the diet. Each dog is their own scientific experiment in that one dog may do very well on a completely vegetarian or vegan diet, and another may do well on just raw meat. A problem arises when a dog's health deteriorates, and their diet is not only not considered, but not altered if the dog's health call's for it - that's irresponsible. 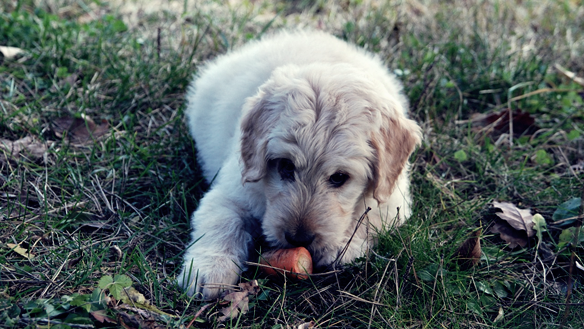 "Myths About Raw: Are Dogs Omnivores?" RawFed.com. N.p., n.d. Web. 14 Aug. 2015. Hawn, Roxanne. "Vegetarian and Vegan Diets for Dogs and Cats." WebMD. N.p., n.d. Web. 14 Aug. 2015..
Holladay, April. "USATODAY.com." USATODAY.com. N.p., 02 Jan. 2002. Web. 14 Aug. 2015. Khuly, Patty. "Are Dogs Carnivores or Omnivores? Here's What New Research Says." Vetstreet. N.p., 5 Nov. 2013. Web. 14 Aug. 2015. Bradshaw, John. "Journal of Nutrition." The Evolutionary Basis for the Feeding Behavior of Domestic Dogs (Canis Familiaris) and Cats (Felis Catus). N.p., 2006. Web. 14 Aug. 2015. Read, Abigail. "Animals: Carnivore, Herbivore or Omnivore?" Science Made Simple. N.p., 27 Feb. 2014. Web. 14 Aug. 2015.